While some states celebrate Arbor Day at other times (presumably times better suited to tree-planting in their regions), National Arbor Day is the celebrated on the last Friday of April. In celebration of this day, I give you the burl, or burr if you live in Britain. 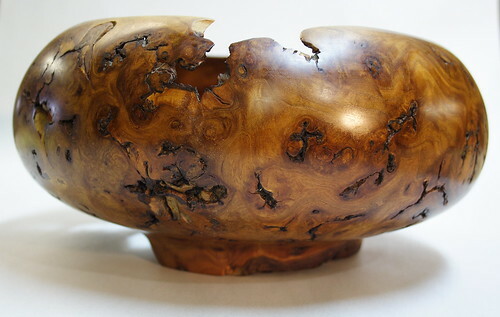 In searching for what a burl is and how it is caused, I’ve read a lot that contradicts. 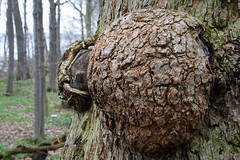 A burl is a dome-shaped growth on the trunk of a tree. Some sources say it will be near a knot but not contain a knot. Other sources say it must contain one or more dormant buds. I’ll keep searching for more information, because now I’m curious. Regardless of how it is formed, the grain inside is always fine and irregular and highly prized by woodworkers. I’ve seen them sliced into flat slabs to make table tops – or the really big ones could even be the headboard on a bed! My favorite pieces, though are the bowls and vases that are turned on a lathe. My hiking buddy, Terry, makes them. You can check out more photos at my Flickr site, or at Terry’s website. Happy Arbor Day (one day late)!